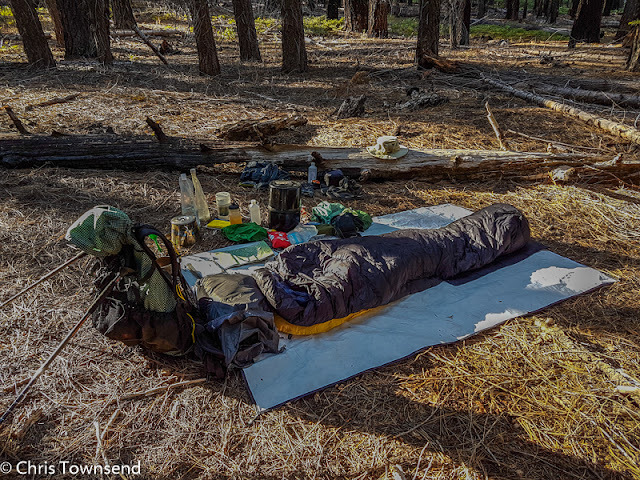 Long walks are not just about the actual walking for me, they're also about the camping. 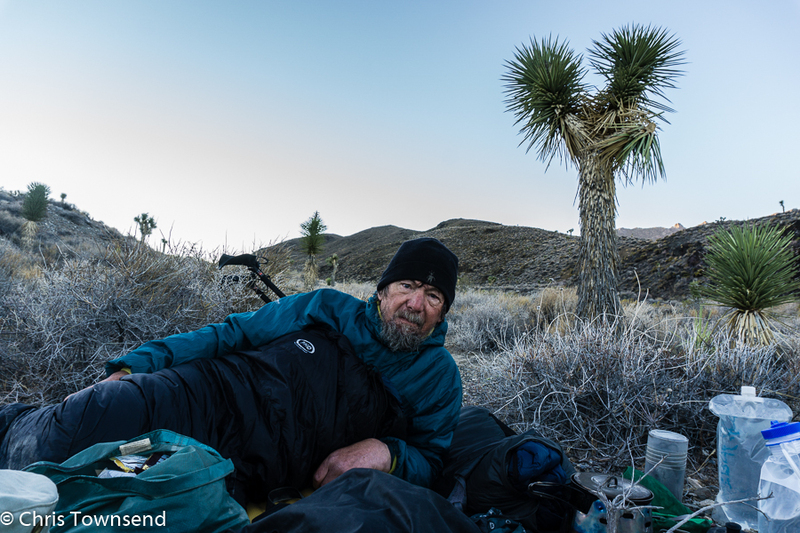 I like to have enough time to stay in one spot and enjoy the landscape in more detail than when passing through - watching the light change, experiencing the night, studying the plants and the rocks. On this autumn walk fewer hours of daylight meant I spent a little less time in camp than I'd have liked but I still enjoyed many fine camps. In total I had twenty-one wild camps plus another five nights on campgrounds and six in accommodation. 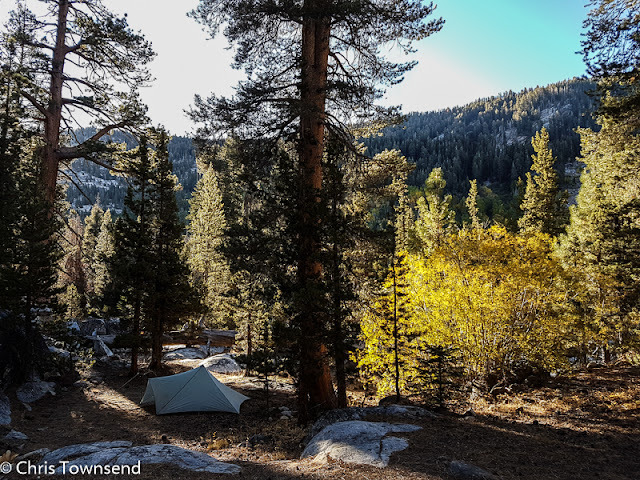 I slept under the stars on thirteen nights and under my tarp - the Mountain Laurel Designs Trailstar - on another eight when it was windy. 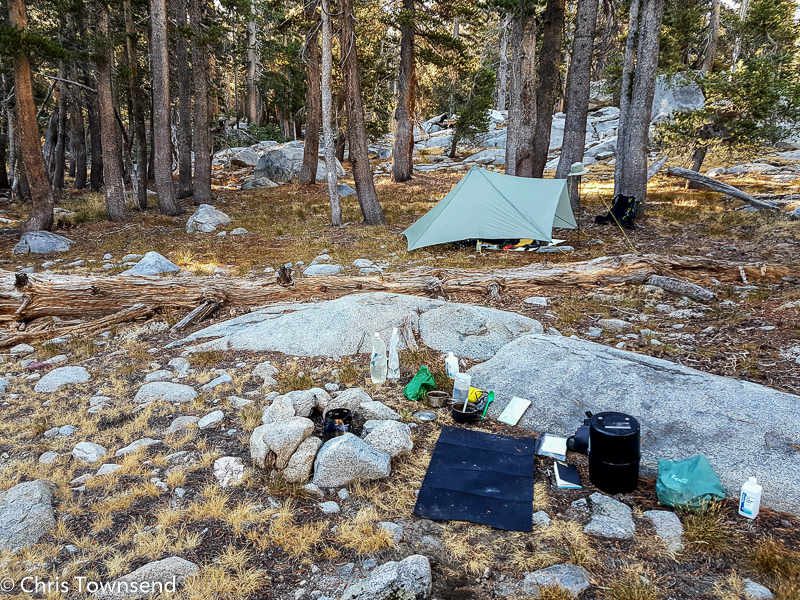 In the High Sierra I generally cooked and ate away from where I slept in the evening in case of visitations by bears, though I sometimes brought my kitchen over to my sleeping bag so I could get back in the latter on chilly mornings. Usually I camped in forests on previously-used sites in the High Sierra. 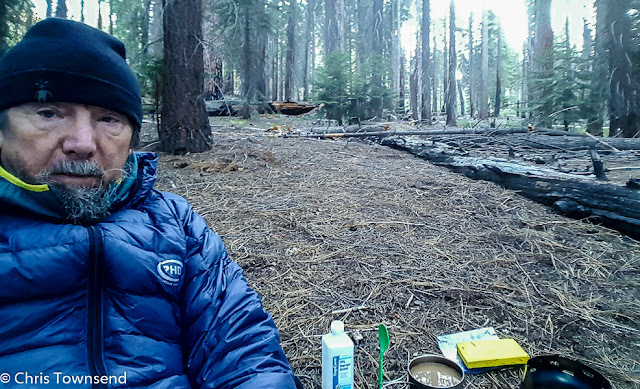 These often had fire rings in which I'd set up my little Caldera Ti-Tri stove, cook on wood, and then have a mini-camp fire to keep me warm on chilly evenings. Sometimes I'd light the tiny fire again in the morning. Unexpectedly the coldest nights were in the first half of the walk. 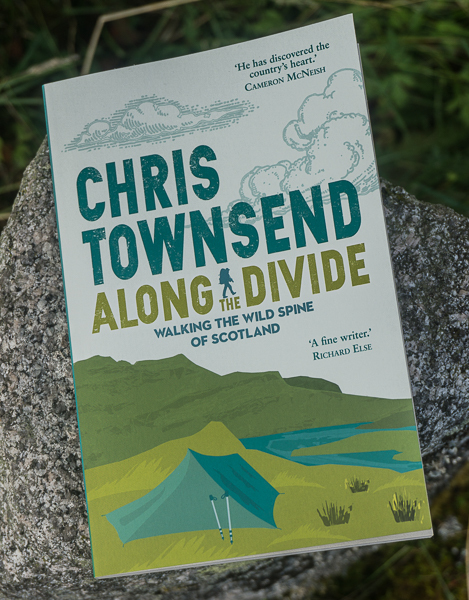 The temperature dropped below freezing at eleven of my first thirteen wild camps, the lowest being a chilly -7.5C. Thinking that it would get even colder in the days to come I added a thick closed cell foam pad to my load as I was finding my air bed barely adequate. After I purchased the pad there were no more sub-zero nights! 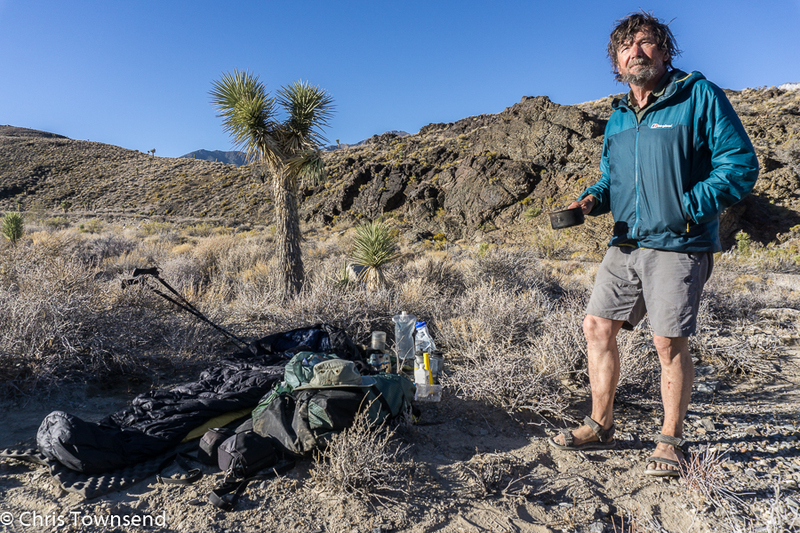 However it did prove useful in the desert section for protecting my air bed against sharp rocks and plant spines that would probably have gone through my groundsheet. In the Bear Creek valley, John Muir Wilderness. After a breezy night with a low of -4.8C the sky clouded over bringing snow, making this the only day with any precipitation. Above Evolution Valley, John Muir Wilderness, at dawn. The sky was blue but there was a bitterly cold northerly wind sweeping this camp at 10,500 feet. 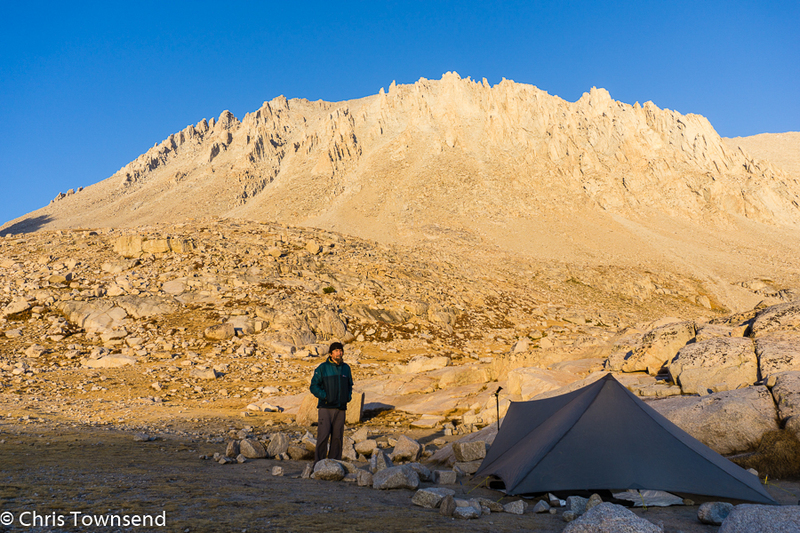 Dawn at my highest camp in the High Sierra at 11,460 feet near Guitar Lake in Kings Canyon National Park. Mount Hitchcock in the background. Leaving the High Sierra for the desert mountains and valleys on the far side of Owens Valley led to an abrupt change of scenery. 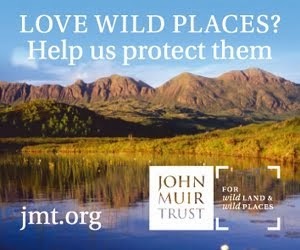 Gone were the magnificent forests, alpine lakes, and rushing creeks. 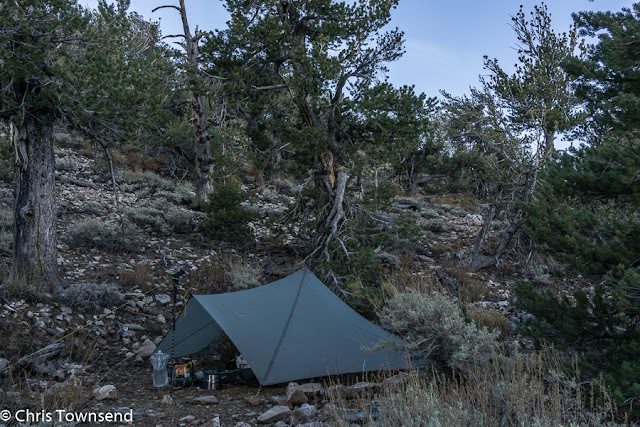 Finding shelter on windy nights was more difficult as any trees were mostly small and widely spaced. There was a harsh beauty here though. 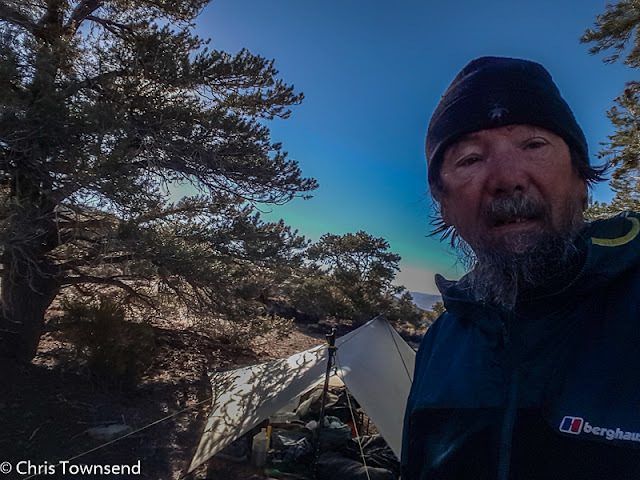 Somewhat bleary-eyed after a disturbed very windy first night on the desert section of the walk camped in the partial shelter of some pinyon pines in the Inyo Mountains. 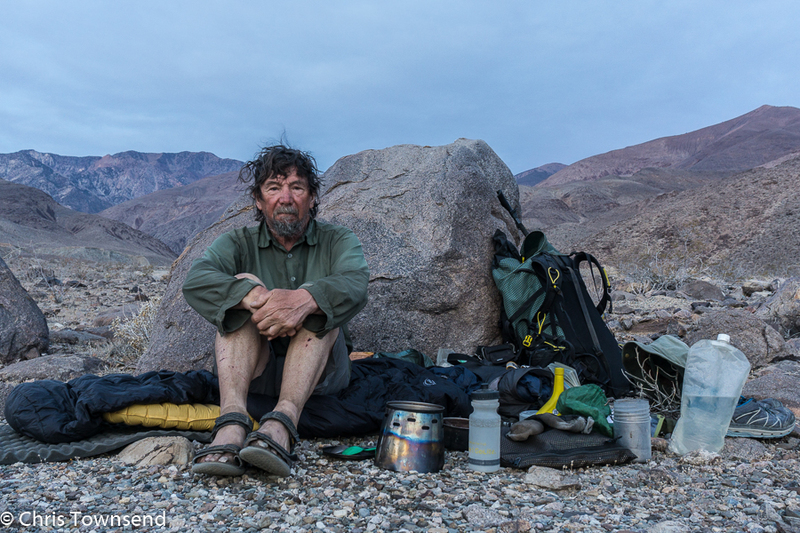 Last high camp at 9,600 feet on the side of Bennett Peak in the Panamint Mountains in Death Valley National Park. I'd hoped to camp in the open but a strong wind had me seeking out a reasonably sheltered spot in a grove of trees. Last camp of the walk in the mouth of Hanaupah Canyon on the edge of Death Valley itself. The boulder kept off a down-canyon breeze. Some fabulous camping spots there Chris. Now, here is the dilemma: do you camp where you will get sun well into the evening or, do you seek out a site that is open to the East, to get early sun in the morning to warm up the camp first thing? It doesn't really matter in summer but, when the days are shorter I reckon it is worth thinking about! 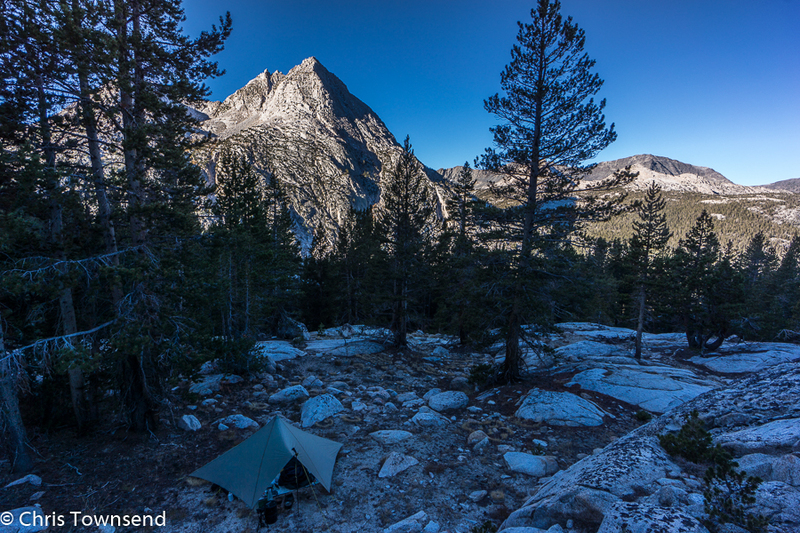 As I was usually camping around dusk or later when there was an option I camped to get the early morning sun. 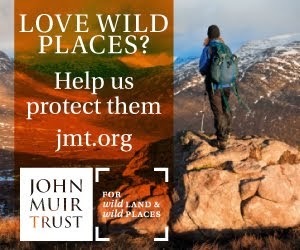 There often wasn't an option though - either because the site was surrounded by trees or because it was too small. Very inspirational as usual Chris! Your writing often makes me want to jump on the next flight out and attempt these routes myself although I know I do not have the planning skills you have for such a venture yet (working on it). Thank you for sharing your adventures.